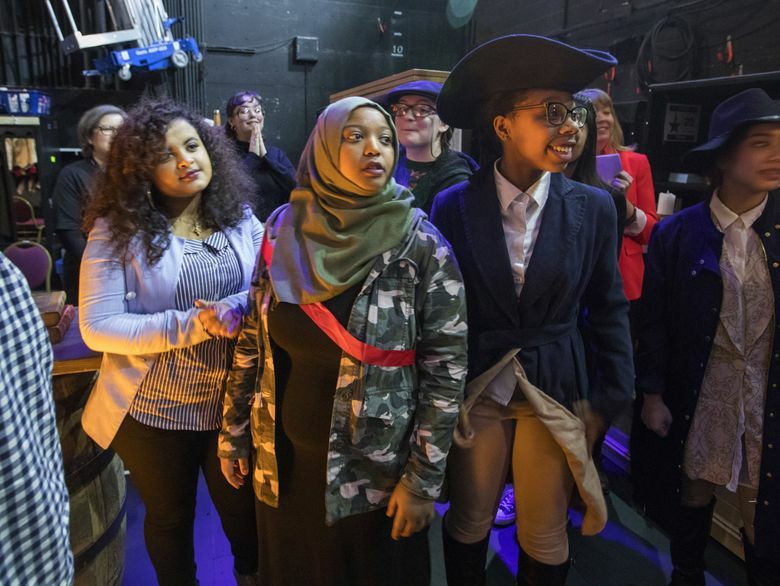 “It makes me feel like I can soar higher,” said junior Kerry Clark, of Tukwila’s Foster High School, who was one of 2,800 students at the Paramount who performed their own work and saw a matinee of the critically acclaimed play. It’s common for audiences watching the critically acclaimed musical to react to the “Yorktown” lyric, but for this audience, it seemed to carry more weight for the crowd. 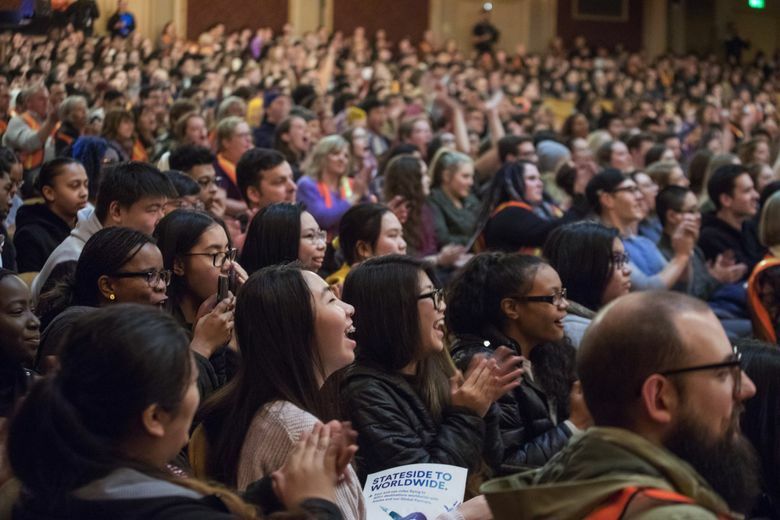 Inside the Paramount Theatre Thursday afternoon, 2,800 high-school students roared. Many of the audience members were children of immigrants or immigrants themselves, like the titular Alexander Hamilton, who was born in the West Indies and became one of America’s Founding Fathers. “Hamilton: An American Musical” is playing at the Paramount through March 18. Tickets are hard to come by, and prices range from $250 to more than $1,000. But on Thursday afternoon, the students from 39 Washington schools attended the matinee performance for $10 — the bill with Hamilton’s face on it. 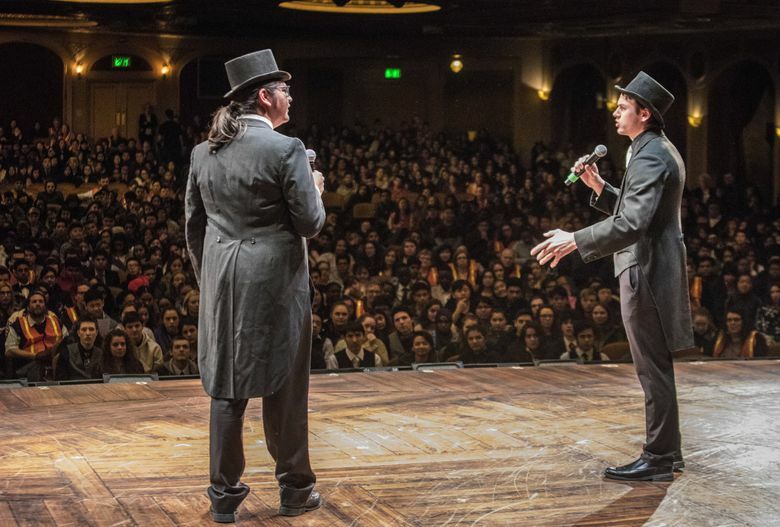 The students, all from schools with a high number or percentage of low-income families, also performed their own work on the Paramount stage inspired by their Hamilton studies and asked cast members question about their experience. Altogether, more than 5,700 students will see “Hamilton” in Seattle as part of an education program launched in 2016 that brings in youth who might not otherwise get to see the musical. 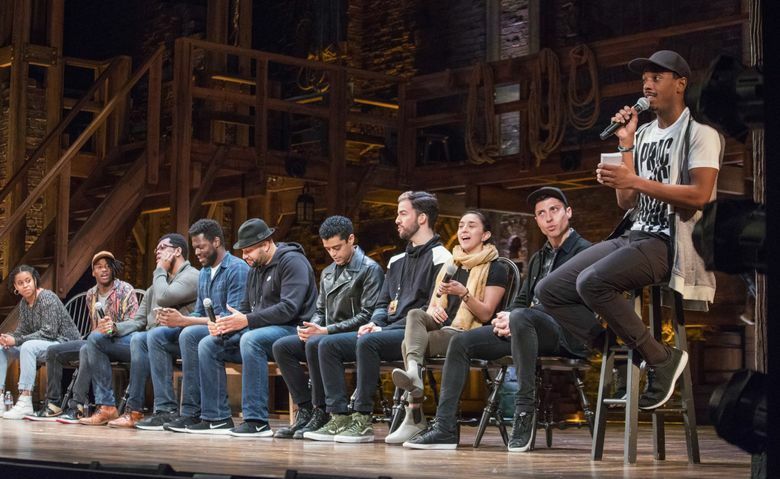 To attend, each participant was required to spend time in their classes studying a curriculum created about the Hamilton era. At Tukwila’s Foster High School, U.S. history-class students spent months learning from the curriculum. Junior Kerry Clark wrote and performed a rap about Richard Allen, a religious leader, educator and writer who was born into slavery in 1760. He hadn’t learned about Allen in history classes, he said. Other students’ work included a song about the Constitutional Convention, a skit about the separation of church and state, and a rap about the Boston Massacre. 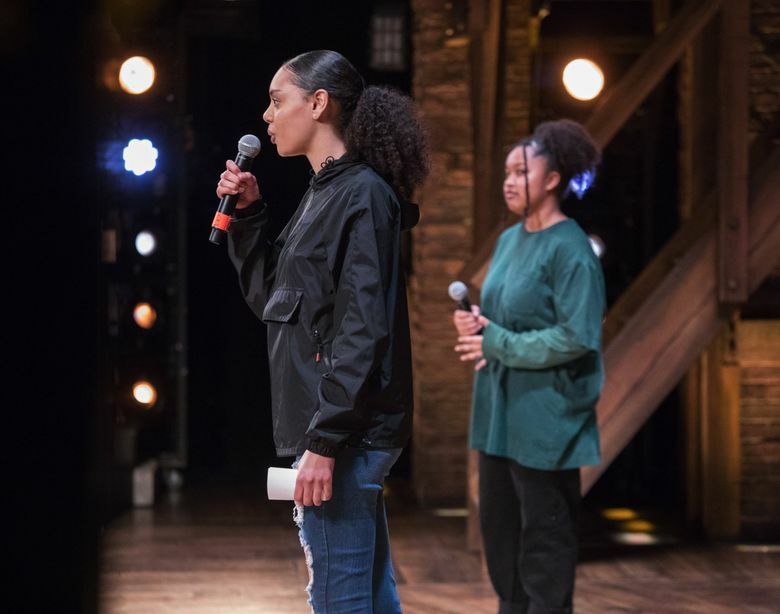 Cleveland STEM High School students Saiyana Suzumura and Kahlia Devenaro performed “Perspective,” a spoken word poem written from a slave’s point of view. The best part of the experience, Suzumura said, was seeing people of color play white characters. “In the media, black people aren’t even seen, so to see it (black actors play white characters), that’s amazing,” she said. 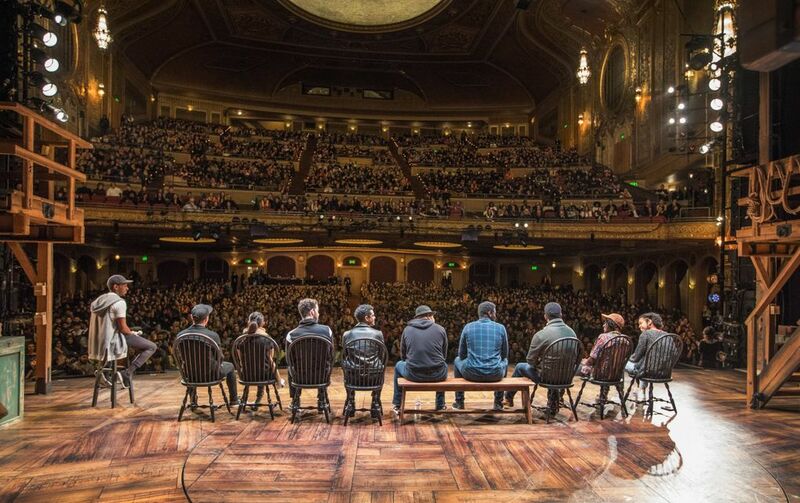 During a question-and-answer session with 10 “Hamilton” cast members, a Chief Kitsap Academy student asked about the significance of playing characters who were wealthy white men. The play changes minds about who can be in power, cast members agreed. It also shows how America was then, but played by the America of today. Kyle Scatliffe, who plays Marquis de Lafayette and Thomas Jefferson, reminded audience members that Hamilton was only a few years older than they are during most of the events in the musical. “Don’t ever listen to anybody who tells you teenagers don’t know anything,” he said. Scatliffe and other cast members encouraged the students to react as loud as they wanted during the matinee; he received a loud cheer when he emerged later on the stage as Marquis de Lafayette. Those emotions continued after the bows. One teenage girl told her friends that she had cried multiple times. Another said she wanted to read more about the Schuyler sisters.